Make yourself at home in one of the 49 air-conditioned rooms featuring flat-screen televisions. Wireless Internet access (surcharge) is available to keep you connected. Conveniences include safes and complimentary newspapers, and you can also request irons/ironing boards. Set in the heart of Doncaster town centre, the Mercure Doncaster Centre Danum Hotel is ideal for guests looking to explore the city. Blending style with convenience, this elegant Edwardian hotel retains many of its original features, including a ballroom. 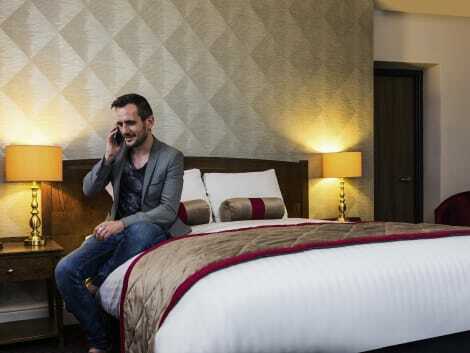 Relax in style in one of the many spacious and well-equipped rooms, or take in the many sites the city has to offer such as Doncaster Racecourse. Refurbished in 2015, the hotel is surrounded by shops, restaurants and bars, all within walking-distance. 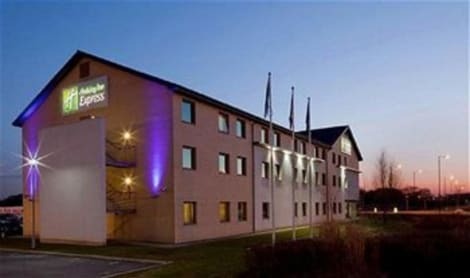 A modern Doncaster hotel with excellent transport links, free parking, free WiFi and breakfast included Holiday Inn Express® Doncaster hotel is three miles from the town centre. There are direct trains to Sheffield, Leeds, York and Manchester from Doncaster station, a short drive away. The nearby M18 and A1(M) motorways provide easy access to the whole region. There's free on-site parking, and the nearest bus stop is outside the hotel. You can join excited football fans at Doncaster Rovers' Keepmoat Stadium or have a flutter at the Doncaster Racecourse, both within 10 minutes of the hotel by car. If you prefer retail therapy, the Lakeside Village Outlet Shopping Centre is less than a mile away. You can host your clients in the hotel's two naturally lit, air-conditioned meeting rooms, which have free WiFi and space for up to 40 guests. If you're in for a long day, you can order catered lunches, from sandwiches and chips to a full, hot buffet. The Lakeside business park, home to many important local companies, is five minutes' drive away. The Express Start Breakfast buffet, with scrambled eggs, beans, sausages and continental items, is included in your room rate. In the evening, settle down to fish and chips or a burger in the comfortable chairs of the airy Great Room restaurant, or unwind with a glass of wine in the bar. 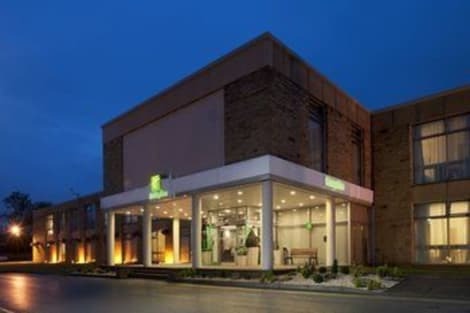 A modern hotel with a restaurant, spa and 300-year-old manor house in landscaped gardens In the quiet village of Warmsworth, three miles from Doncaster centre, the Holiday Inn® Doncaster A1 (M) Jct.36 hotel is close to the A1 (M) and M18 motorways and has ample free parking. It's a 10-minute drive to Doncaster Station. Doncaster Racecourse and the Yorkshire Wildlife Park are both close by. The 300-year-old manor house in the landscaped garden is a grand venue for weddings and meetings. Host conferences for up to 300 guests or smaller gatherings in the hotel's 13 modern meeting rooms. WiFi is free and audiovisual equipment and catering options are available. You can work out in the Fitness Centre, relax in the steam room, or float in the heated indoor pool. It’s all free for guests. Grab a light bite to eat and a cold pint at the Preludes Lounge Bar. Looking for something more? Taste the soup of the day or tuck into a juicy steak in the Restaurant. Kids stay and eat free – and they have their own special menu at the Restaurant. The hotel's 102 comfortable, air-conditioned rooms all feature free WiFi and workspaces so you can surf the Internet or catch up on work. Satellite TV with pay-per-view options, 24-hour room service and a pillow menu all help to make this Doncaster hotel a Yorkshire home from home. With a stay at Kellett Hotel in Doncaster, you'll be a 3-minute drive from Doncaster Racecourse and 5 minutes from Doncaster Dome. 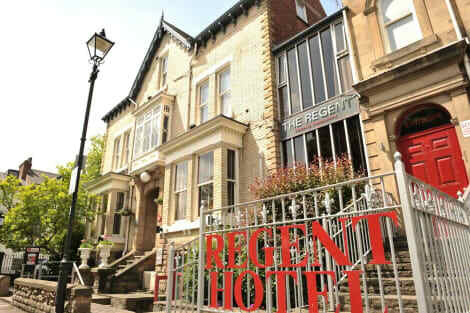 This hotel is 5.3 mi (8.5 km) from Yorkshire Wildlife Park and 0.5 mi (0.8 km) from Cast Theater. Enjoy a meal at the restaurant or snacks in the coffee shop/café. The hotel also offers room service (during limited hours). Relax with a refreshing drink at one of the 4 bars/lounges. Full breakfasts are available for a fee. When you stay at Best Western Premier Doncaster Mount Pleasant Hotel in Doncaster, you'll be near the airport, within a 10-minute drive of Yorkshire Wildlife Park and Doncaster Dome. This 4-star hotel is 5.4 mi (8.8 km) from Doncaster Racecourse and 1.1 mi (1.8 km) from Northern Racing College. Set in the heart of South Yorkshire on the banks of the River Don, the thriving market town of Doncaster attracts visitors from far and wide thanks to its rich history, busy retail centre, attractions and museums. The local area offers a wonderful mix of vibrant urban life and culture as well as natural beauty and unspoilt countryside. 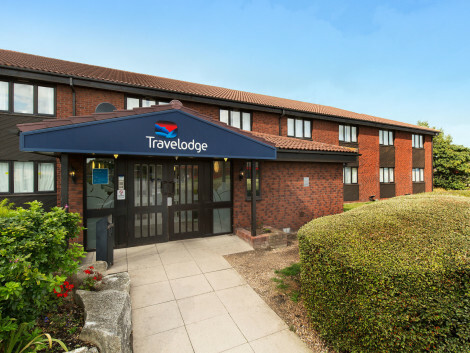 If you're visiting the area we have a wide variety of Doncaster hotels available, each one within easy reach of the town's major sights. There are numerous museums within easy walking distance of the town centre. Take in the latest art exhibitions and displays at Doncaster Museum and Art Gallery, before brushing up on your military history at the excellent King's Own Yorkshire Light Infantry Museum. Markham Grange Steam Museum to the north of the town has some fine examples of lovingly restored steam engines, and there is also a garden and nursery on site. Catch a film at Vue Cinema in Doncaster Leisure Park, or enjoy a night at the theatre at Cast events centre or The Doncaster Little Theatre. A major draw for visitors to Doncaster is the town's famous racetrack. Regular meetings have been held at Doncaster Racecourse since the 16th century and today the calendar is filled with flat racing during the summer months and jumping throughout the winter. The prestigious four-day St. Leger Festival is held at Doncaster every September. The centre of Doncaster is filled with a great mix of independent stores and national chains. Frenchgate is home to top-name brands and many businesses open late on Thursday evenings. Doncaster Market is the place to find hundreds of colourful and varied stalls each Tuesday, Friday and Saturday. A farmers' market is held there on the first and third Wednesday of every month. Meadowhall shopping centre on the outskirts of Sheffield is one of the region's major indoor retail hotspots and attracts people from across the county. It's about an hour's drive from central Doncaster. With a wide selection of dining establishments to choose from, you'll have no trouble finding something to suit your taste. The town has a vibrant nightlife scene, with bars and restaurants filled throughout the week. For independent eateries look towards Copley Road and Nether Hall Road, while the town centre is the place to go for everything from traditional pubs to smart wine bars and jazz clubs. Take a look down Priory Walk to find a great selection of establishments.